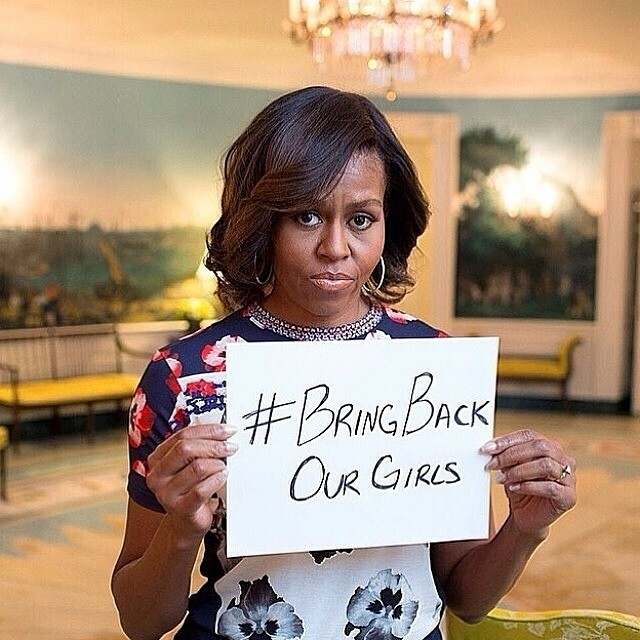 Is Hashtag Activism Saving or Hindering Kidnapped Nigerian Girls? I got into a back-and-forth debate with my best friend yesterday about the usefulness of the #BringBackOurGirls hashtag flooding Twitter, Instagram and Facebook, recently. My bestie thinks the avalanche of hashtag activism for the Nigerian girls will make things even worse rather than helping the girls get reunited with their moms. She pointed out that more girls are getting kidnapped as a result of the attention. And the issue shouldn’t be minimized to scrawling four words on a blank page and hoping Boko Haram will be so embarrassed by the attention they’ll return the teens. Okay, I get it. I don’t think any of us are so naive to believe Boko Haram, who Al-Qaeda even disapproves of, will be persuaded by our pleas. But, if it wasn’t for the hashtag activism the U.S. wouldn’t be sending aid to them now. Nigeria’s govt wouldn’t be offering $30K reward for those with info on the kidnapping. The hashtag was all the moms could depend on when their voices fell on deaf ears with Nigerian govt, until President Jonathan was pushed (by the trivial hashtags) to speak on the issue. So, yes, I stand by the #BringBackOurGirls hashtag for awareness. And not only that. What else can we do? How else can we express our anger, heartbreak and disgust as a whole? These abducted schoolgirls are my sisters and I call on the international community and the government of Nigeria to take action and save my sisters. It should be our duty to speak up for our brothers and sisters in Nigeria who are in a very difficult situation. I know people are weary of trends. And fear this is another one the West is so easy to adopt and neglect for the next hot topic dripping from social media’s fingertips. So, like Nigerian novelist Teju Cole and sociologist Zeynep Tufekci, ponder the next step in this process and whether it serves its purpose. Arguing whether "hashtag activism" works misses the point. Yes it works to generate attention. Question is: how, and what does attention do? The "something" eventually done will likely—as in the past—get many other boys and girls killed, and no one will be accountable for it. On #bringbackourgirls. Another example that hashtag activism can generate attention. Everything else after that gets complex, very quickly. All valid points. But, I’d rather be accused of making noise about an issue then staying silent while more people suffer.